Among the earliest artists who worked predominantly in watercolor in America were several women who rose to prominence. Mary Ann Willson was one of these. Imagine being an artist and basically a pioneer on the American frontier in the second decade of the nineteenth century. No art supply stores, no galleries to show your work, and few sources of inspiration. And yet this amazing woman actually thrived by selling her watercolors. Willson’s work was unknown until 1943 when a collection of her watercolors was discovered in a New York gallery. The works were accompanied by an anonymous letter dated 1850 that detailed what little biographic information is available on her. Apparently Willson and her partner, a Miss Brundage, built a log cabin in Greenville, New York in 1810. While her partner farmed the land, Willson produced watercolors which she sold to neighbors. According to the writer of the letter, “An Admirer of Art,” Willson’s watercolors were in demand from New York to Mobile, Alabama. Living in the wilderness, Willson used bright colors made from such materials as berry juice, brick dust, and vegetable dyes. Untrained, she drew images from popular prints in bold colors and simple shapes. The boldness of color and strong decorative pattern combine with a total lack of interest for conventional drawing, perspective, or realism. The Prodigal Son series she produced, of which this work is a part, was a subject particularly popular with American settlers. The foppish attire of the male figures is obviously based on fashion plate illustrations of the day, a major source of inspiration for Willson. After Miss Brundage died in 1825, Willson was said to have been inconsolable. No further watercolors were produced after that date, and Mary Ann Willson disappeared from the art world. What she left behind was a wonderful body of work that gives insights to rural American frontier in the early days of the country, produced by a self-taught artist. Willson’s story inspired Isabel Miller’s 1972 novel, Patience and Sarah. See more of Willson’s works at the National Gallery of Art and the Museum of Fine Arts, Boston. 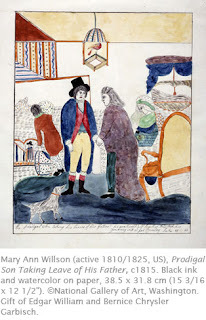 Connections Across Curriculum - The popularity of Mary Ann Willson’s paintings during her own lifetime points to the young country’s interest in the frontier. As westward expansion depleted the wilderness, the idea of frontier life became mythologized as a uniquely American experience. This can be seen in works by other artists of the time, such as members of the Hudson River School, as well as in literature, most notably that of James Fenimore Cooper. Students can explore the conditions in which Willson may have lived in Cooper’s novels, including The Last of the Mohicans and The Pioneers, set in New York State. I have what I think is a print by Mary Ann Willson"The Prodigal Son Reclaimed". I would like to know any information about the print.It's orgin...etc. Thanks for your website and the chance to do research.